You might have seen on Twitter on Tuesday morning (25th November) that #VATMOSS was trending in the UK. To me this meant nothing, but as I started to see crafty designers and bloggers that I follow posting about it I gave the trending link a click to see what it was all about. What a mess! I am by no means an expert, so please do not rely on my interpretation as fact (instead look through the links I have included in this post from places of more authority on this subject), but an introduction of new EU VAT laws will dramatically alter the way pattern sellers (such as I hope to become) are legally required to do business within EU territories from 1 January 2015. Currently in the UK you are only required to register for VAT when you earn over £81k per annum, and all sales (digital and physical) are subject to the VAT laws of the country in which the seller is based, meaning I can sell my Spiderman pattern anywhere in the world and I won't have to file for VAT (forgive my poor terminology, I'm not business literate) as I earn under the threshold. The threshold isn't even on my radar in my wildest dreams. But from the 1 January 2015 all digital (not physical) sales will be subject to the VAT laws of the EU country in which the buyer is based, and will have no threshold of earning. If I even sold my pattern just the once to a resident of Germany (could even be a family member on holiday there buying it) I would have to register for VAT in Germany and pay up quarterly, or register with HMRC's 'one stop' VAT service. But I would still have to register for VAT and this, according to The Telegraph, will mean I will have to charge and file VAT on any physical sales as well! There is also an excellent overview of the situation available to read on The Huffington Post. I hope you agree this is ridiculous. Having recently decided to wholeheartedly pursue pattern designing and selling, once I had realised the full weight of this law and what it meant for me I was devastated. Before I had even begun I would have to stop and rethink what I wanted to pursue with my crafting. Perhaps there would be a way to block European customers from purchasing my patterns, though this would be unfair and would in turn prevent me from buying American patterns (easily cutting off at least something like 60% of all patterns available to buy on Ravelry). But there has been a wonderful collaboration to help us out! 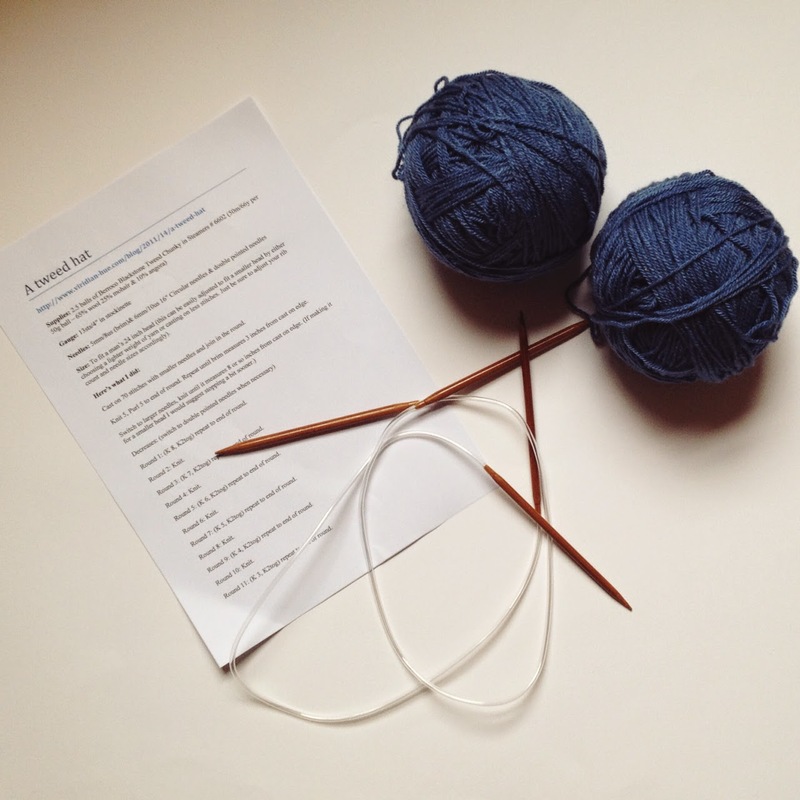 Ravelry and Love Knitting have come to an agreement which means that Ravelry designers can now sell their patterns through Love Knitting, and as they are VAT responsible people like me will not have to register for VAT nor file any returns! It does mean that Love Knitting will need to take off VAT for any purchases, and they will take some commission, however there will be a commission free period of 6 months, no doubt to ease designers so used to the free nature of Ravelry into the new system, and also in the hopes that VAT rules might change back. 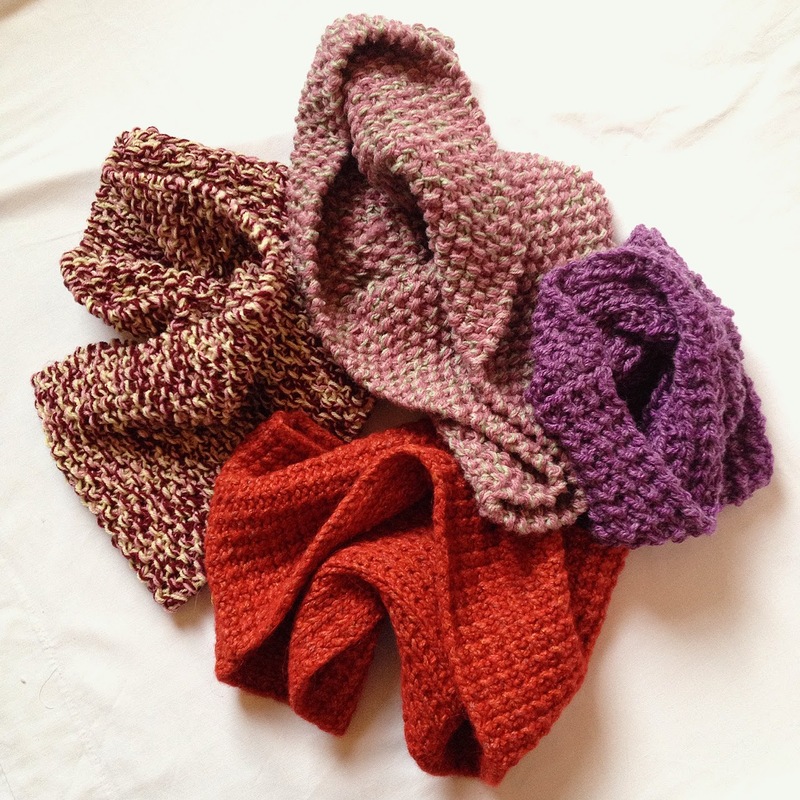 You can also read the full announcement on Ravelry. This is SUCH a relief! 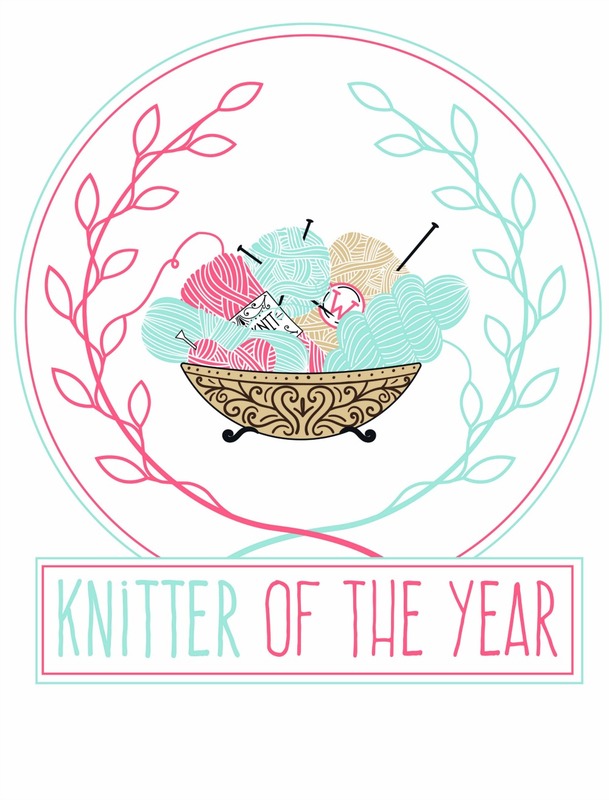 I am currently in the process of signing up to become a Love Knitting designer - I will be certain to share my page with you as soon as it is up and running! 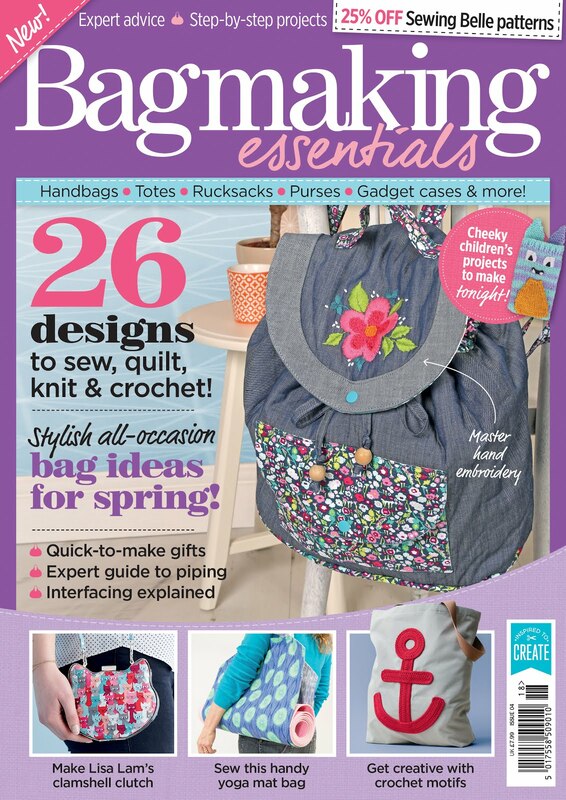 Although a solution (however short or long term) has been found for knitting and crochet designers, there is a multitude of other small and micro businesses at risk (online tutorials, graphic designers, self-published e-books etc.) which is why I would recommend you sign this petition calling for the VAT exemption threshold for businesses selling digital downloads to be upheld. Will #VATMOSS (or #vatmess) be affecting you? strictly speaking, I'm using circular needles here to knit a flat piece of knitting, but it is so comfortable and look how much knitting I can get on the needles! Earlier this week I finally learned to do something which has been on my 'knitting to do' list for ages - knit with circular needles. 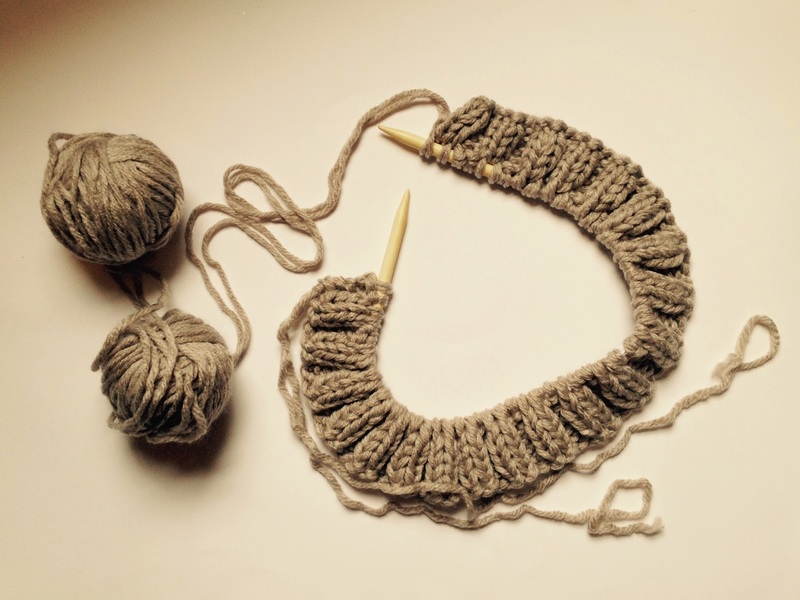 This is something that I have wanted to do for so long because there is actually a finite number of things to be knitted on straight needles, but now I say NO MORE to avoiding patterns on Ravelry that state they are 'in-the-round' - I am a liberated knitter! That was a super geeky thing to type, and strictly speaking I could already knit in the round on double pointed needles, but I really am so excited that I now know how to use the mysterious contraptions that are circular needles, and even know that wondrous technique that is the 'magic loop', particular after friend B and ladies at my knitting group all go on about how much easier circular needles are to use. So this is all leading up to me sharing with you how I learnt to do this (as a mostly self-taught knitter using the wonders of the internet!) so that if you want to learn too, you can. First things first, you will need some circular needles to work with. 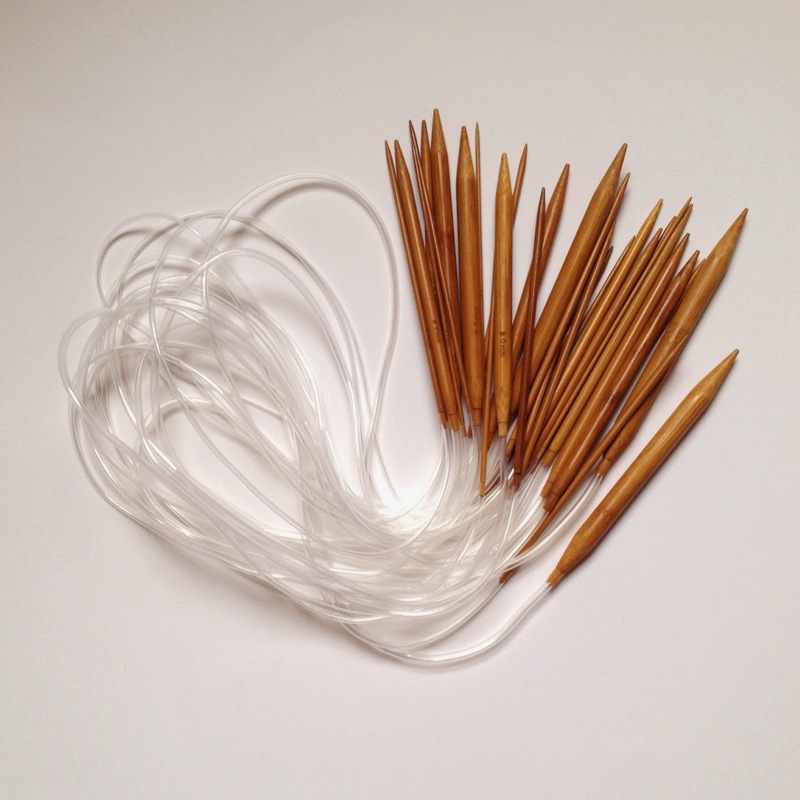 As I was looking for as large of range of sizes as possible - because who knows what exciting knitting adventures we will go on as we grow up - I bought this set of 18 bamboo circular knitting needles. I did so because I saw last month that the lovely Elise over on Foof and Faff had bought a set, and from further enquiries on Twitter she said they were worth the pennies. 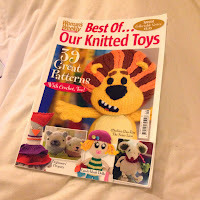 So far I have transferred a diabolically difficult scarf onto a set of these, and learned how to knit a tube on another pair, and for the £3.20 that you pay for the lot - yes, you read that correctly, £3.20 - I think that this set is worth it, particularly for a beginner circular knitter. Just be prepared for some sticking of your knitting as you often find with new needles, but nothing that can't be worked through, and I am in no hurry to spend more money on needles. Using circular needles is as easy as pie(patronising alert..but I like the term so much) if you want to work a large project flat, you simply carry on like you normally would with straight needles and the plastic connector (technical term alert..) will carry the weight of your knitting, which actually makes it more comfortable to hold the work in progress - bonus! 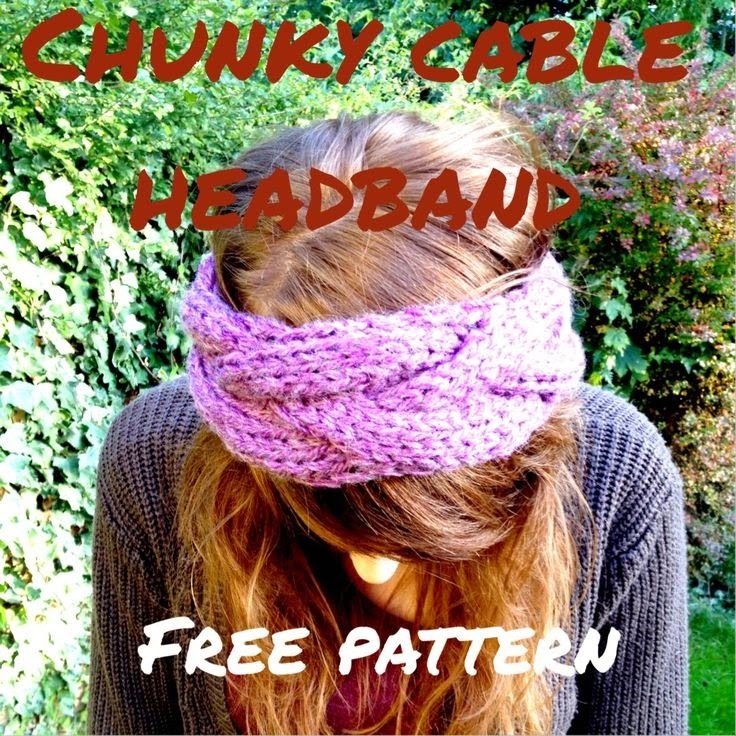 However if you want to knit in the round you will need a teacher or a good online tutorial. After some quick googling I came across this absolutely perfect lesson for using the magic loop technique, for when your knitting is too small for the length of your needles. Tin Can Knits have an easy photo step-by-step guide on how to knit with the magic loop which I picked up on the first run through, and would heartily recommend. 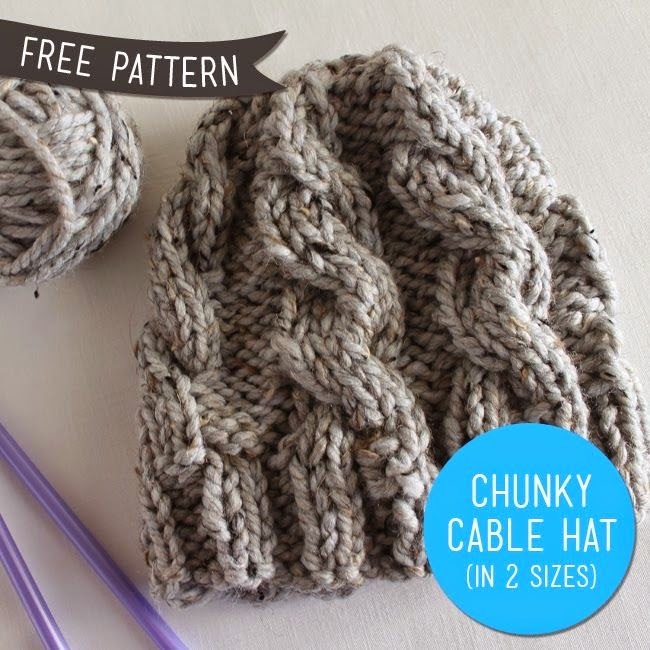 And the best part is that it is easily transferable if you are knitting something larger and don't need to magic loop, you simply knit in the round continuously, marking your rounds with a stitch marker. I'm really looking forward to making lots and lots of things with all my circular needles - but I do have one problem now, how do I store them all neatly? Any hints or tips? the items i sent to gemma! 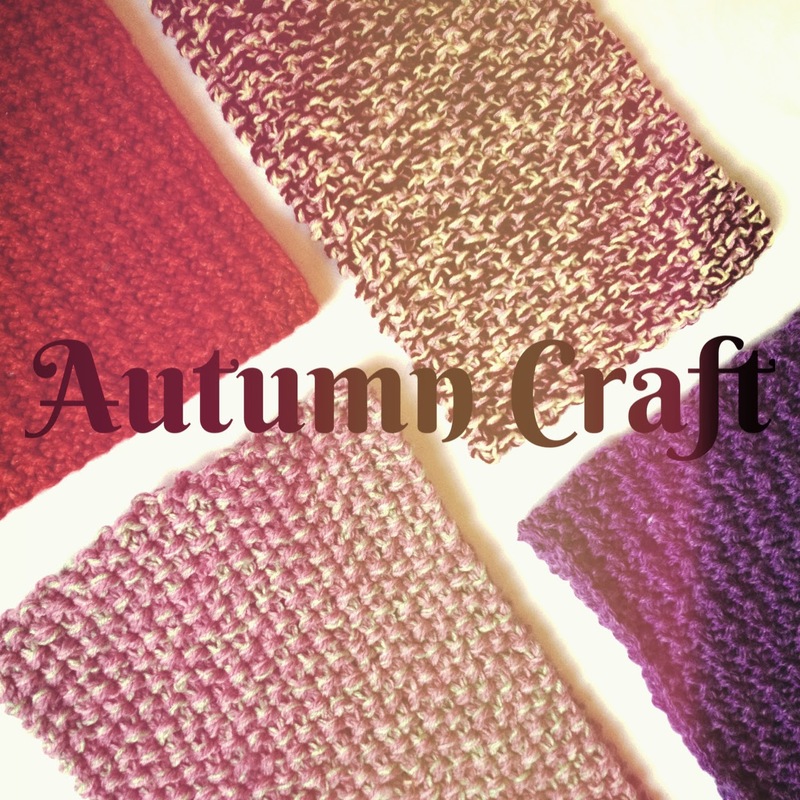 As you may have realised by now, every month I take part in a marvellous craft swap hosted by Hannah, who blogs at Dainty and Ivory, under the name #dicraftswap. 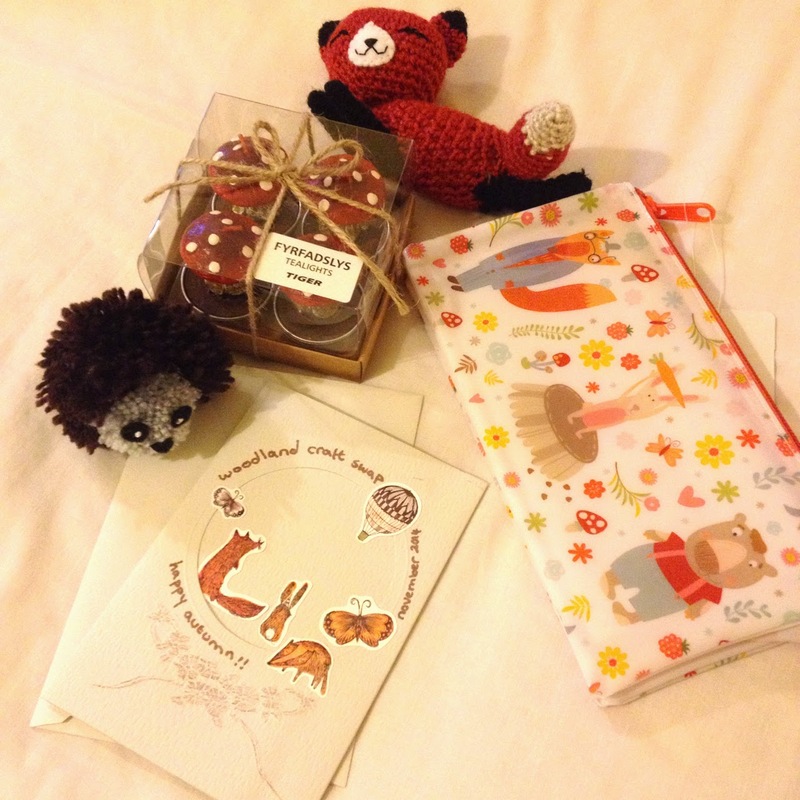 Last month's theme was WOODLAND and I was given Gemma, who blogs at Lipstick and Lashes, to send my goodies to! 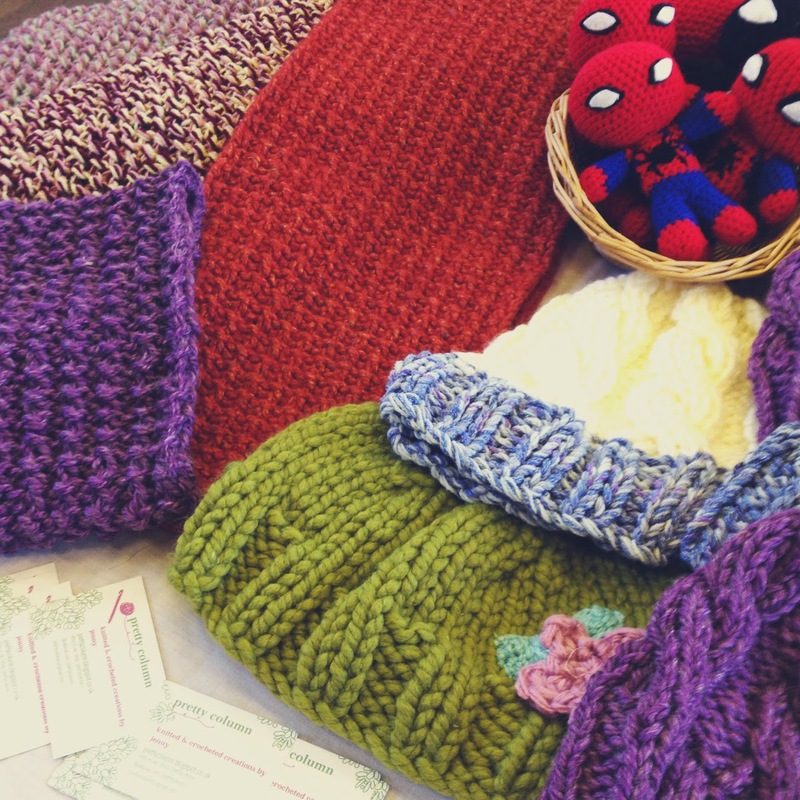 The rules of the swap are always send at least one handmade item relevant to the theme and include a bought gift of minimum value of £3. This month I included 3 handmade items and 2 bought ones! I knew that, with a woodland theme, I finally had a great excuse to try out making a pom pom hedgehog which I have wanted to do for ages! 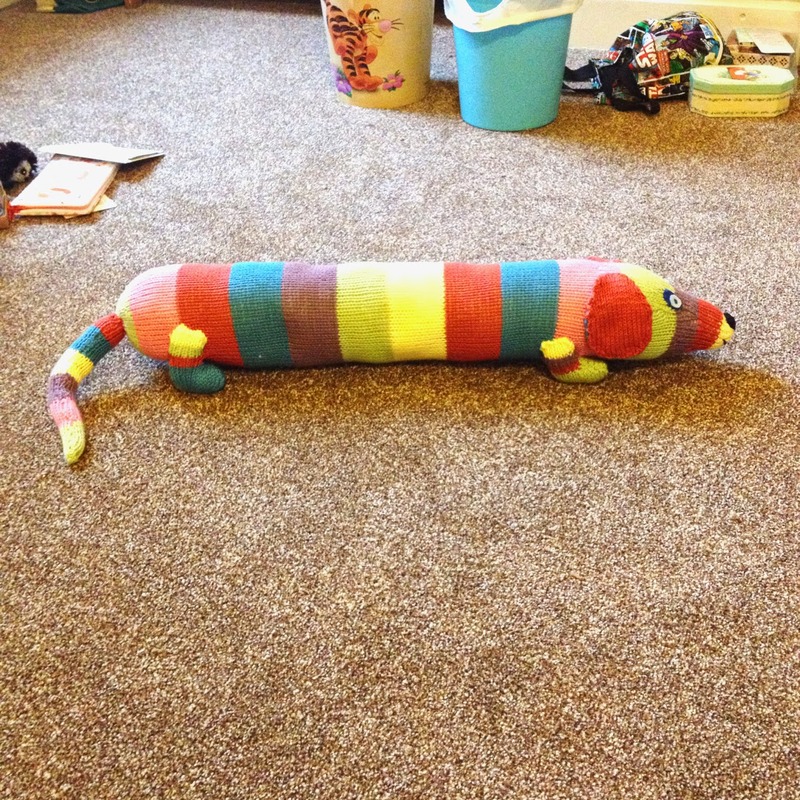 I must admit he didn't come out nearly as beautifully as the pictures on pinterest, however having made him I thought it would be a shame not to send him anyway. You will also see in the top picture a card which I put together myself. Well, handmade may be stretching it as I used stickers and wrote some things, but I like the way it came out! 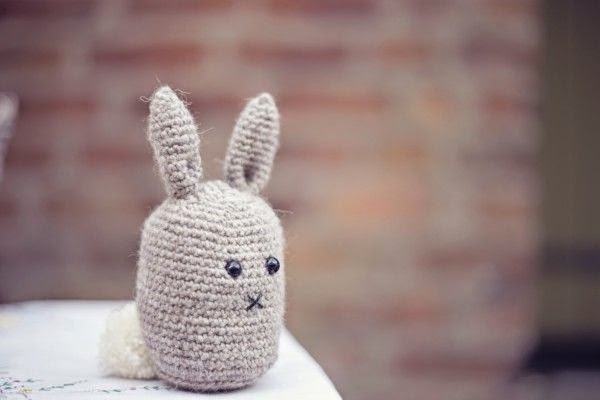 The 'piece de resistance' of this month's make however has to be this adorable little fox! 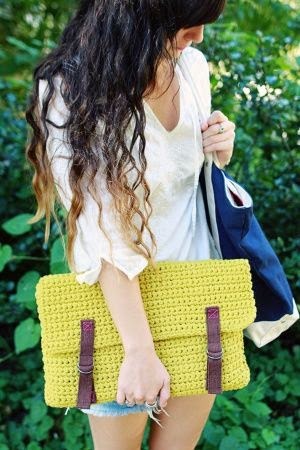 She was a lovely crochet pattern I found through Ravelry from the blog Crafty is Cool (what a perfect name for a blog). The pattern is easy to read and is actually for a mother and baby fox who cuddle! 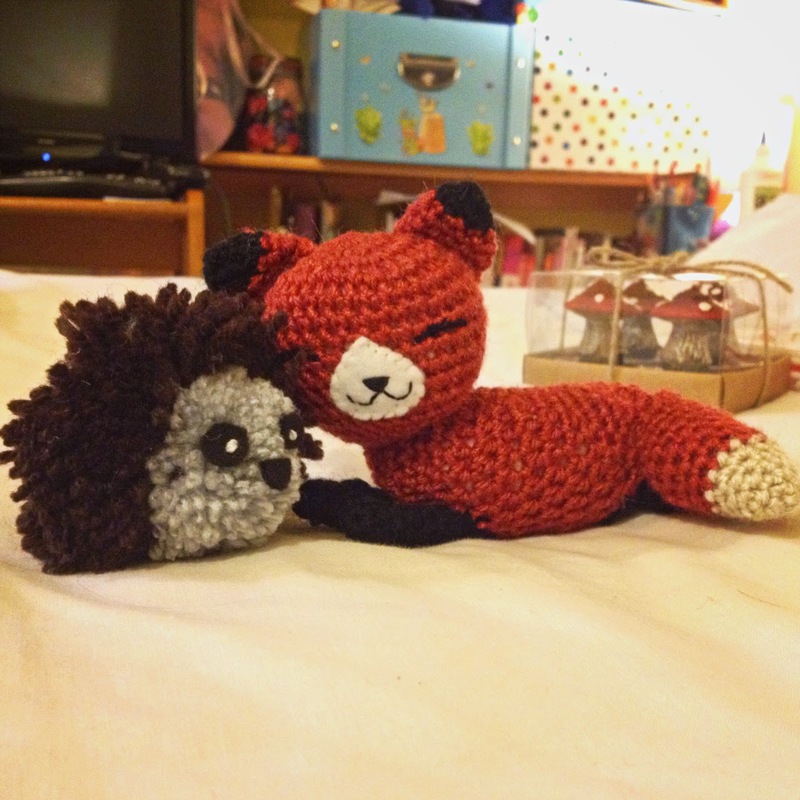 I just made the mother fox due to time constraints, but it was so easy to replicate the emotive face, and the fact that the fox is lying down and looking so happy just makes this such a pleasing make, both to create and to give (and I hope to recieve!). 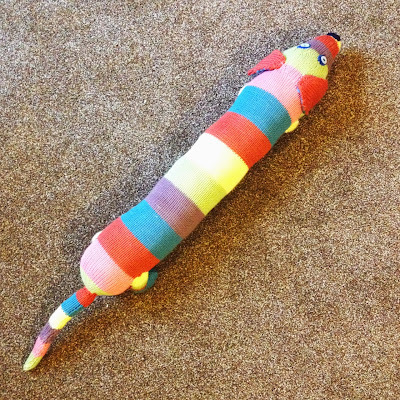 I was so pleased I got to make a fox this month (luckily Gemma mentioned foxes in her description). 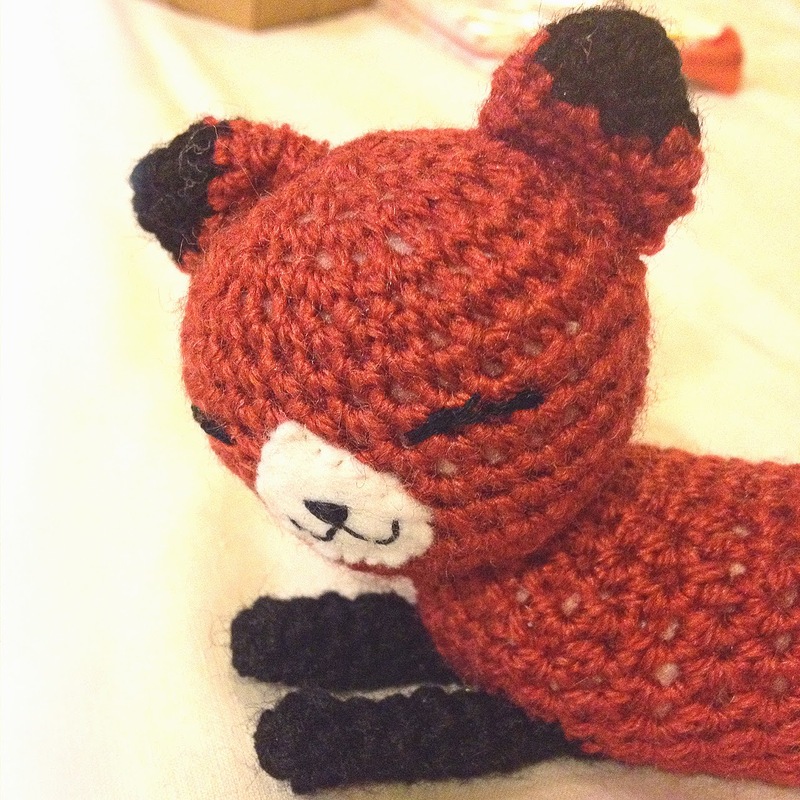 I would heartily recommend this pattern for anyone looking to crochet a fox! I bought a woodland themed pencil case to send with the swap, but didn't feel this was enough. Then, shopping in Leicester while visiting best friend M, I came across a new shop that is popular in Europe (or so I understand) called Tiger. I am GUTTED that they do not have an online shop, because seriously it was a beautiful shop! Filled with so many excellent things, both everyday and gifts, at wonderful prices (but of very high quality). I wanted to get so much Christmas shopping done, but I was getting the train home and I assumed I could shop online...not so much... 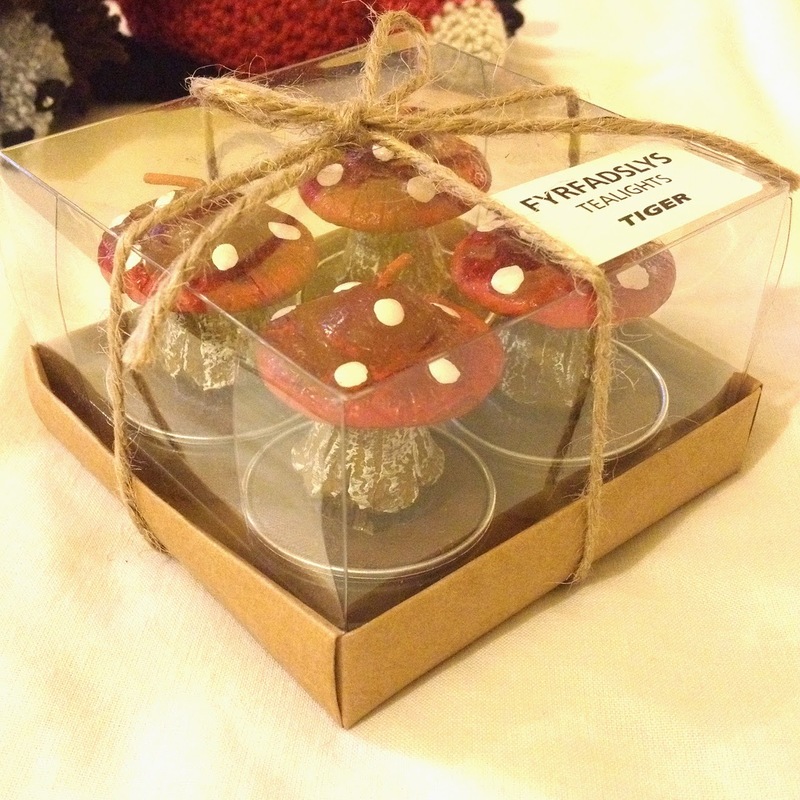 However I was sensible and snatched up these excellent toadstool tea lights! 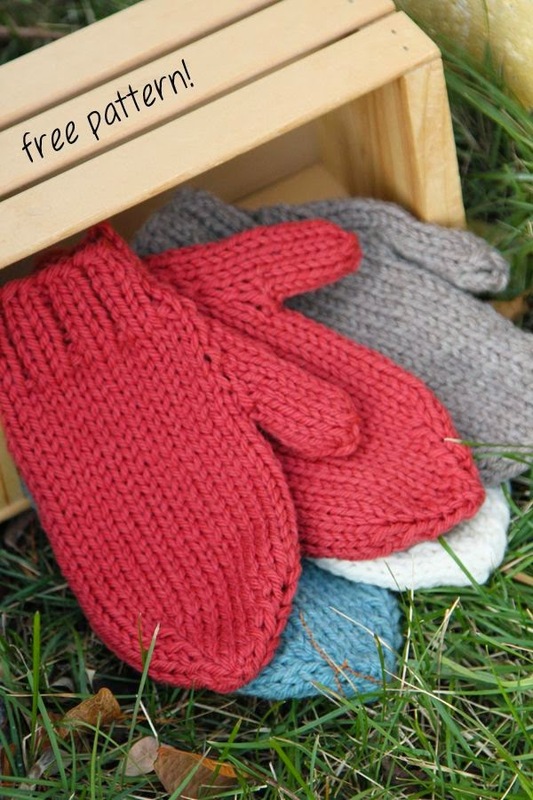 Such a perfect wintery woodland gift! So there you have what I sent this month. 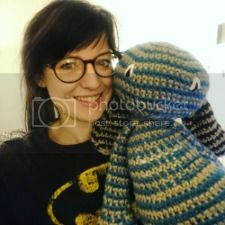 I will be receiving my swap from my lovely friend Charlotte (It Started Out with a Stitch - her crochet is brilliant!). Unfortunately she hasn't been too well and had a stint in hospital - get well soon lovely - so she asked if she could send it around my birthday instead with something extra - so thoughtful, I am genuinely so touched :) So I will blog about that early December hopefully! Next month's theme is, what else, but CHRISTMAS!! 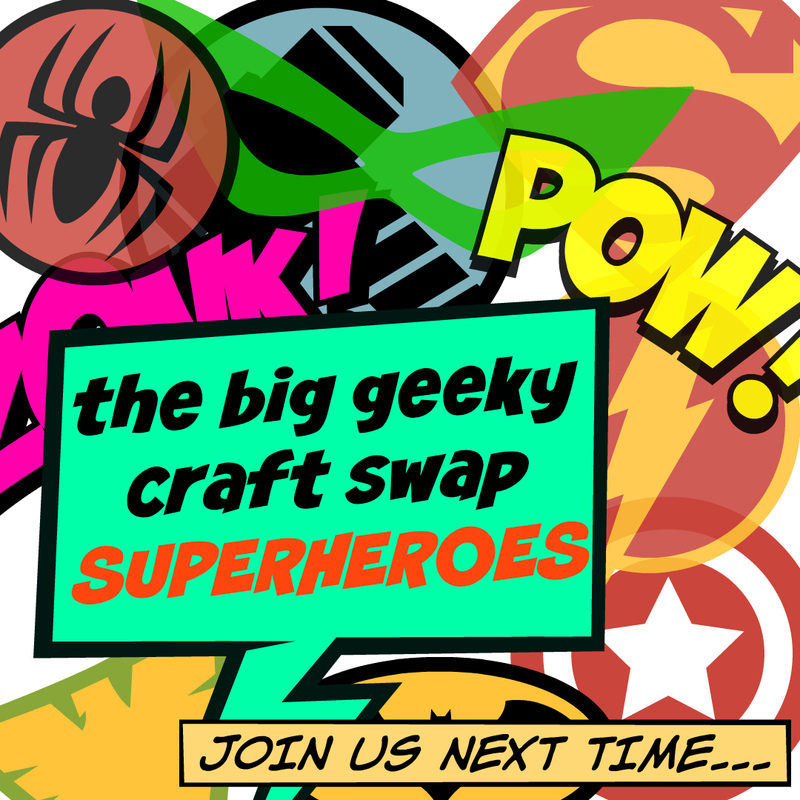 Unfortunately sign up is closed now, but if you are ever interested in joining in the swap be sure to get in touch with Hannah, either on her blog or twitter! So most people who know me and B know that we LOVE Avatar the Last Airbender (just look here at one of my earliest posts, showing off my hand made Avatar blanket! 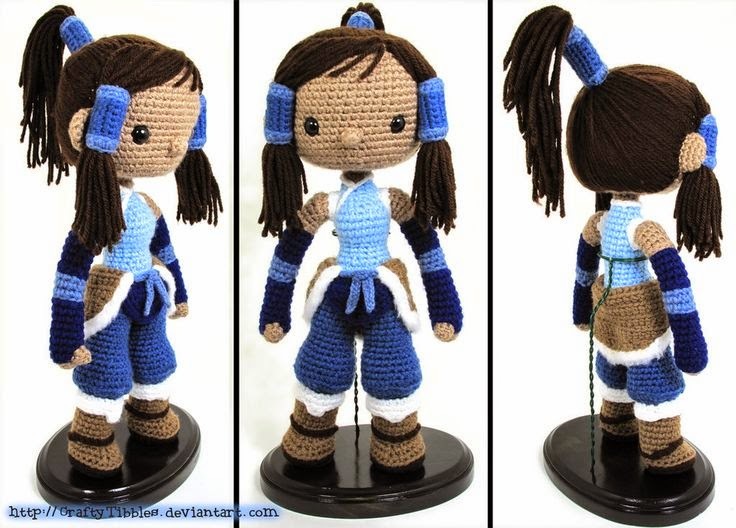 ), and similarly Avatar The Legend of Korra. 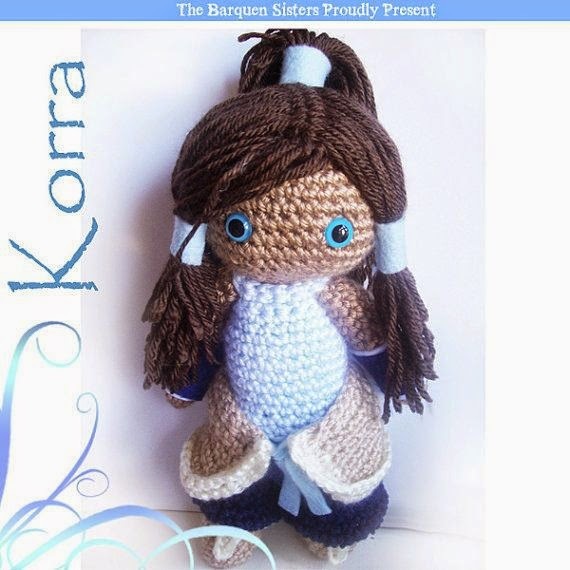 We are very behind on watching Korra though (no spoilers please!) and in order to get back into the swing we just watched the whole of series one of Korra this weekend to get us set up for the next few seasons. In doing so my love of the show and philosophies have been reincarnated with a fervour. 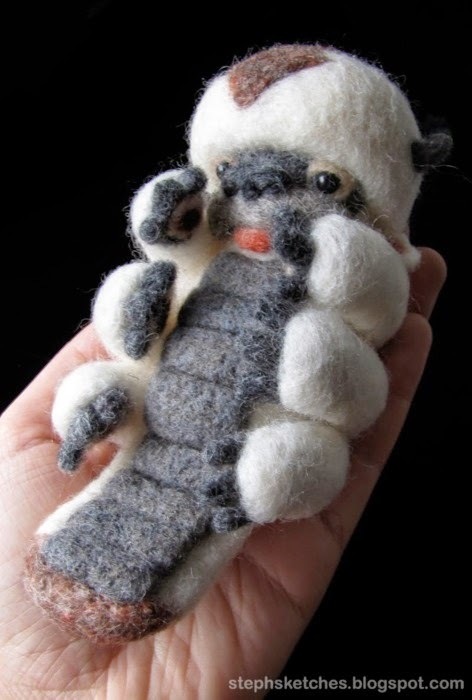 I have for so so long wanted to learn how to needle felt, and this little Appa just fills me with that desire all again - doesn't he just look so adorable? 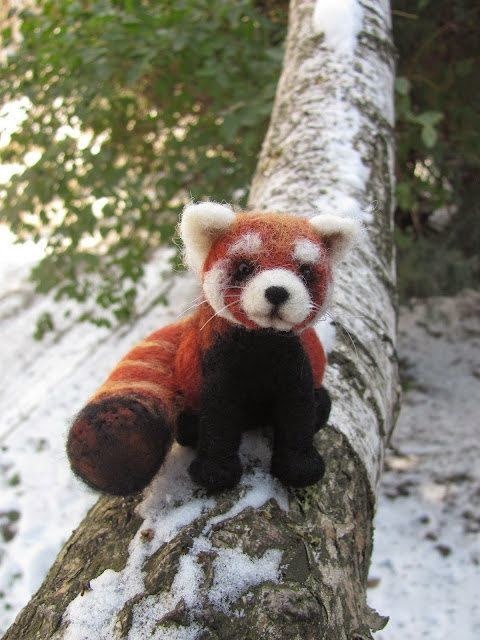 Similarly the needle felted Pabu (Bolin's trusted companion) would make the perfect pal for Appa, and wouldn't you say he looks enough like a real animal that he might even work as a present for someone who isn't an Avatar fan. Korra is such a wonderful character - a really well thought out, strong female lead - and I would love to be able to make something of her because of this. 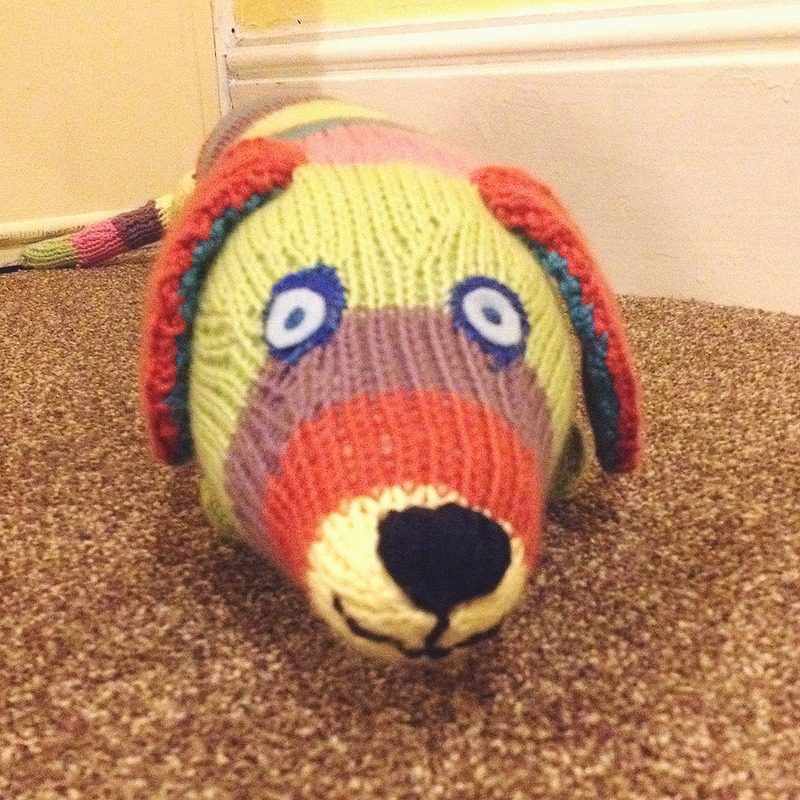 Crochet is my forte in this sort of thing but so far I haven't been overly impressed with the pickings online. However this surely will encourage me to design one for myself, and I think I would relish the challenge! I will say this however, the hair on the dolls above is spot on! 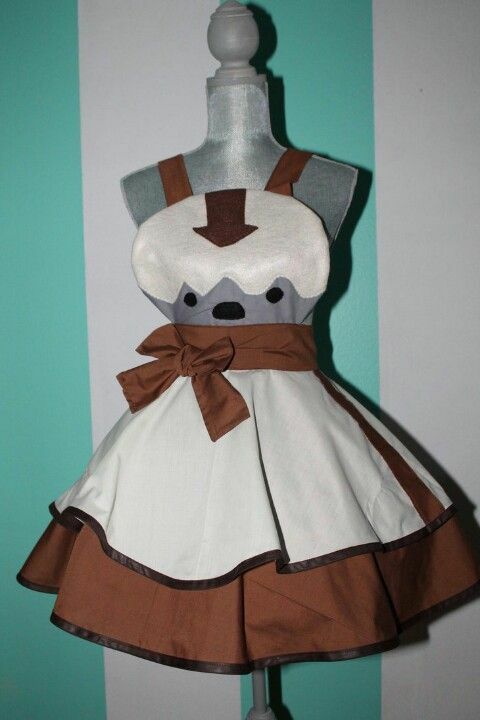 The link for this pin is only an image, and so I can't really tell whether this is a dress or an apron! I think it will make a beautiful apron though for work round the house (while saying 'yip yip' of course!) and with the simple bold shapes it should be easily replicated when I am so inclined to make the time! 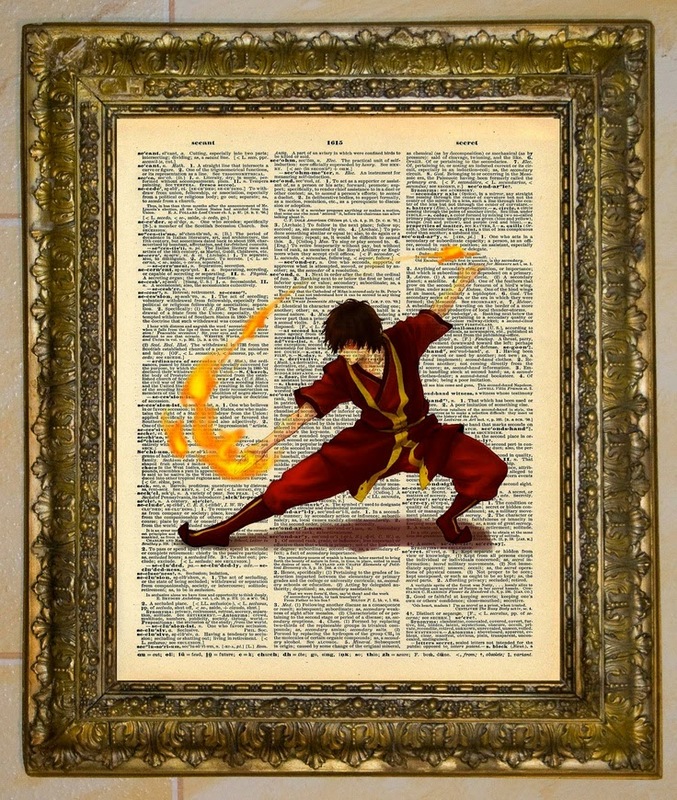 At the Drive In has these great prints on dictionary pages for reasonable prices, and as well as Zukko they sell Korra, Aang, and several other pieces from really all the best sorts of geeky lines! I will have to treat myself to one/several when I have a better place to hang them (*coughcough* christmas present idea anyone?) but it could also be replicated on a more simple level, perhaps with a solid block template? This really is just the tip of the crafty ice-berg when it comes to Avatar themed crafts - you can see more of my inspiration over on my geeky-crafts pinterest board! I would love to know if you like Avatar - which of these crafts would you best like to have a go at? Now I must impatiently wait for the weekend to roll round again so that B can come home and we can watch series two of Korra!! Pretty self-explanatory title wouldn't you agree? So I mentioned last week in my crafty ramble post that I was working towards a craft fair, and on Saturday I went along and did it! As you can see I had a relatively full table which was in a prime position directly in front of the main entrance so my table was pretty much the first that people saw upon entering. Can't really ask for more now can you? 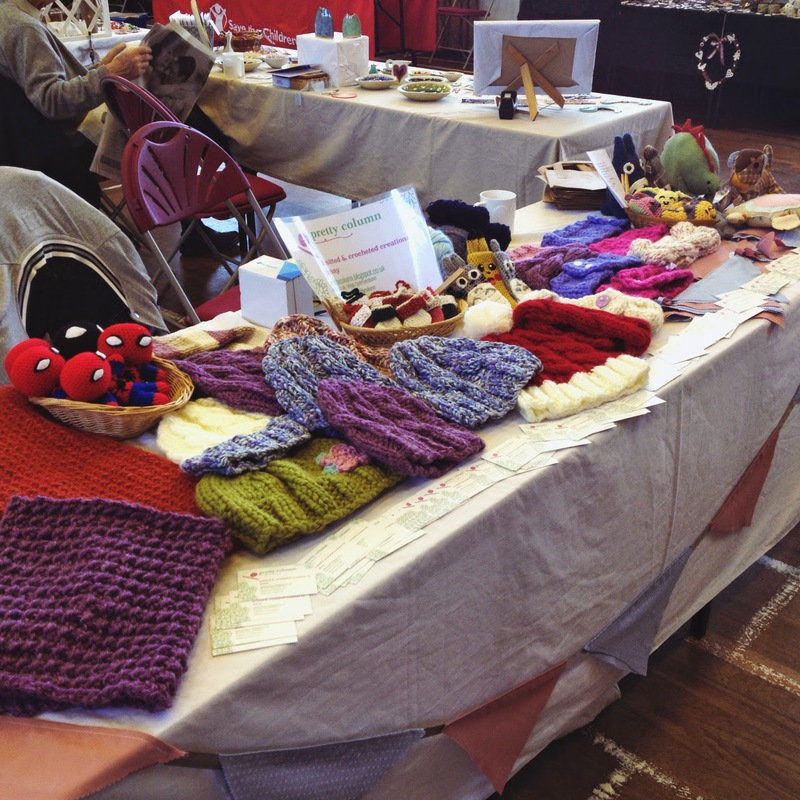 I had a nice full table and lots of professional looking business cards adorning my table. Needless to say I was proud of the work I put in to preparing for this fair, even if I had come to resent that preparation. All my trouble the night before however on pricing items was thrown out the window when I saw what other tables were charging and I immediately lowered the price of everything by a couple of pounds. Perhaps that was over cautious, or selling myself short, but once you appreciate the fear and anxiety of having people critically eye everything that you have spent hours making - some with little more than half a glance at your face, no matter how big you smile - I felt desperate to show that my stuff was worth buying, if not for the quality then perhaps the price. That was maybe a little melodramatic, but it was a nervy affair! Made more so by the occasional older lady who demanded (rudely) why I had not made something else that they wanted, such as gloves or clothes for babies - an explanation of not having anyone small enough to model such items on was not a good enough reason. 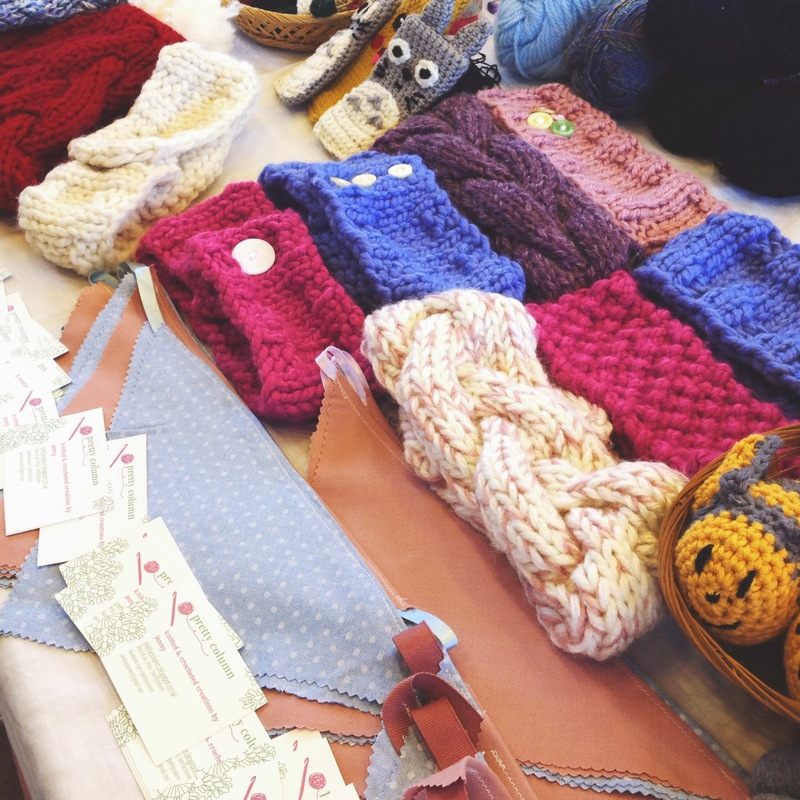 But they were in the minority, and everyone who has ever been to a craft fair must know that crafters and those who appreciate crafts are really such a lovely bunch who can get along together so easily and warmly most of the time. Which is why the day was fairly enjoyable! 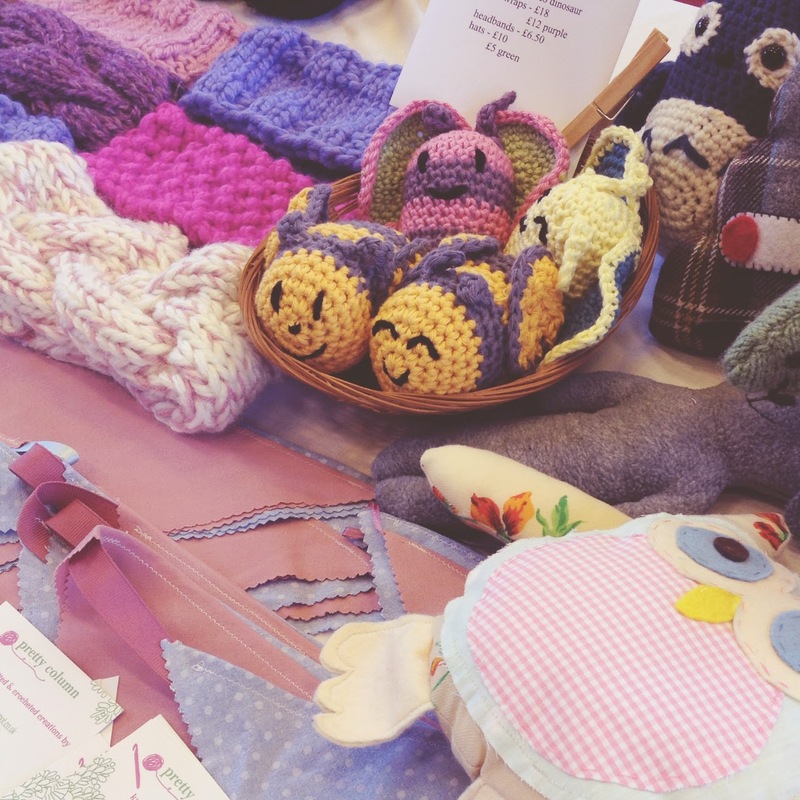 I really was so glad I went through with the craft fair, but having done that now the relief I feel for no longer having to prepare for it, being able to move back to knitting and crocheting the items that I want to make for myself/gifts for people I love. And to feel that relief really vindicates the feelings I was having leading up to the fair! So I learnt something, I enjoyed myself, and the pleasure at selling some items showed me that I would be happy to carry on selling the things I make, but prefer if people let me know what they want before hand! So yesterday I finally bought myself a shiny new laptop, since my university--days laptop finally bit the dust in June/July after 5 years of loyal service (I say loyal in a tongue-in-cheek way there as I really learned to hate that over heating, slow, rickety, blue-screening, poor-battery-life laptop - but it was my first one so I feel a little loyal!). So the day after October pay-day I ran to PC World and now I have a lovely new laptop! 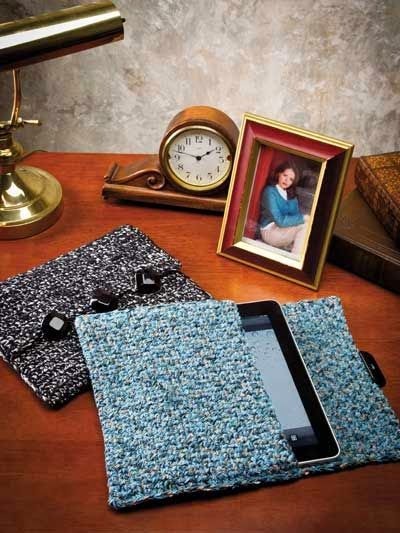 But I need a laptop case to go with it - the perfect inspiration for this week's idea-list! 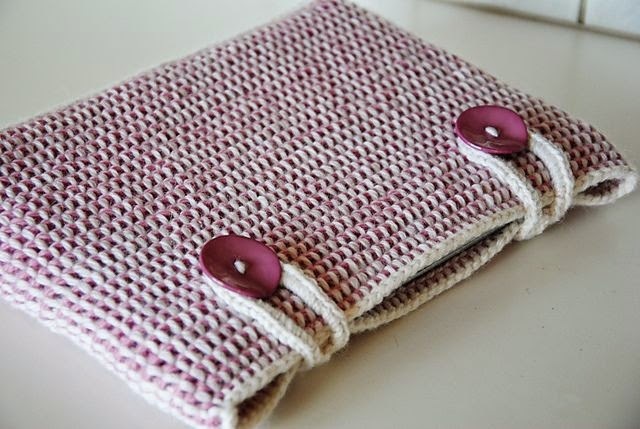 Though I have sewn a tablet sleeve just last January, I would much rather knit or crochet a laptop sleeve (I intend the cover to protect it in house rather than for travels - the bonus of owning a tablet as well I shouldn't need to carry my laptop round too much) being my favourite crafts. If you would like to see some more knitting and crochet inspiration, why not follow me on Pinterest and find out what inspires me on a day-to-day basis. Although you need to register with Lion Brand to use this pattern, I have been happy with the quality of the patterns that Lion Brand provide (particularly the cardigan I knitted in July - you can find the pattern on Ravelry, along with notes from other users) and this crochet pattern looks really fashionable - it even includes some useful straps! 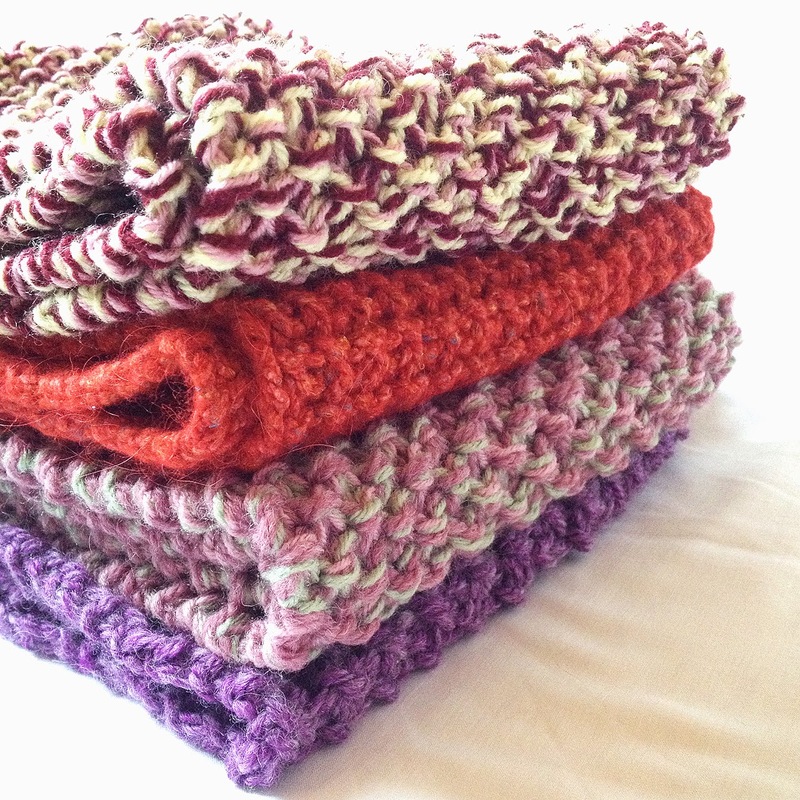 Though the edging on my crochet never looks very finished, and I think that may be very obvious with this pattern. 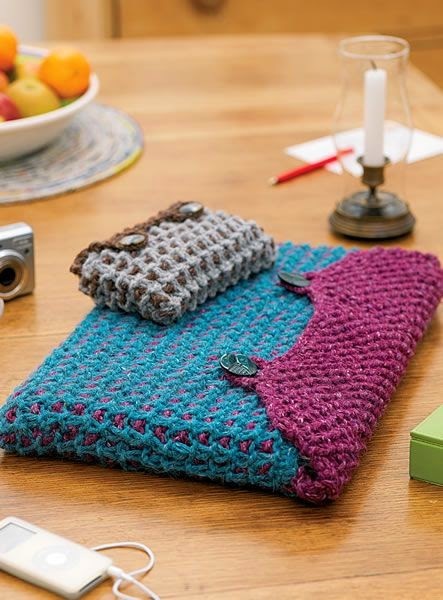 Although I am leaning towards a knitted cover (as my knitting is a lot neater than my crochet) the finish and colours on these covers are so lovely I might be inclined to make this one! I would change the buttons myself though as I'm not keen on them - what do you think? 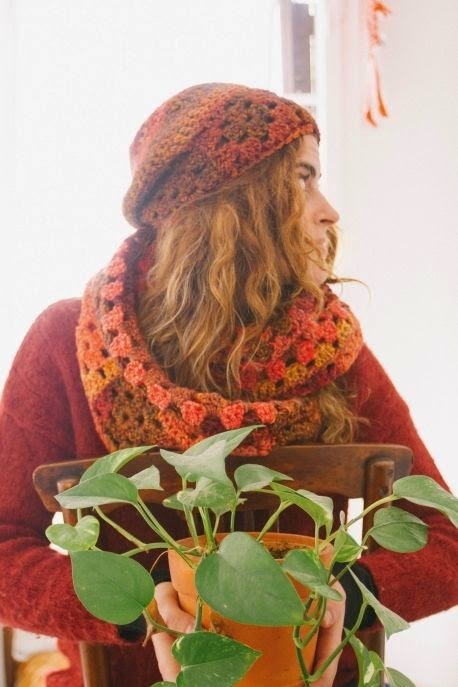 This has to be the winner for me - knitted, bold colours (I may change them dependent on what I have in my stash to save some pennies) and a technique I haven't tried before (garter slip stitch), with the bonus of being from a trusted source from which I have used patterns before. 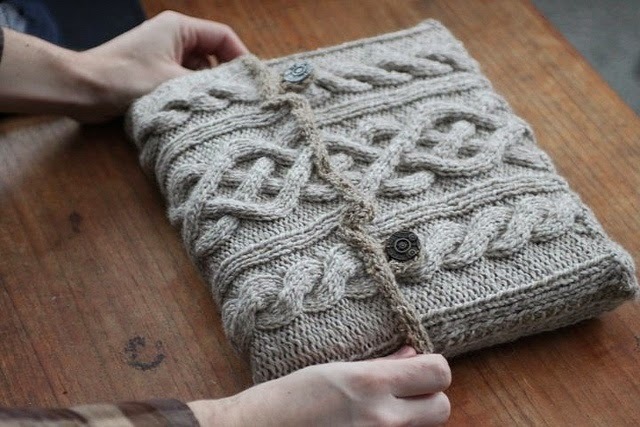 I actually currently subscribe to Let's Knit magazine and I do like the patterns that they provide, and think I would be very happy with a laptop cover that looks like this, though perhaps some brighter colours. If you had to choose, which laptop cover would you make/most like to have?